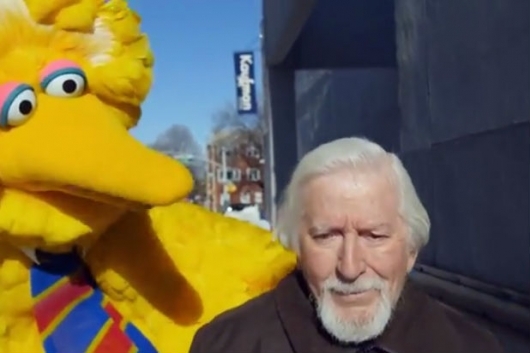 Big Birdman stars Caroll Spinney as himself as he goes from his dressing room to the streets of New York while his fictional alter ego Big Bird berates him in the nicest possible manner about the choices they have made in life. This video is perfectly fine for kids so don’t expect Big Bird, whom Spinney has played since Sesame Street‘s first season in 1969, to start swearing in a gravelly voice. Birdman, starring Michael Keaton, Zach Galifianakis, Edward Norton, Amy Ryan, Emma Stone, Naomi Watts, and Andrea Riseborough, is available now DVD, Blu-ray, and Instant Video. The 87th Annual Academy Awards airs live Sunday, February 22nd, 2015, at 8:30pm ET on ABC, with the live Red Carpet arrivals starting at 7pm ET/4pm PT.